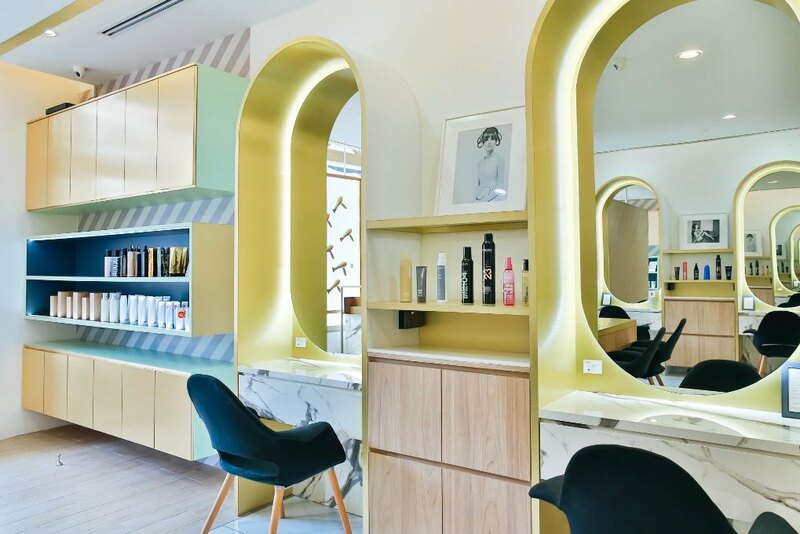 At these top hair salons in Singapore, your struggle against frizzy and flat locks can finally be put to rest. Our humidity and year-round summer make sure of that – but you don’t have to tear your, err, hair out over it. 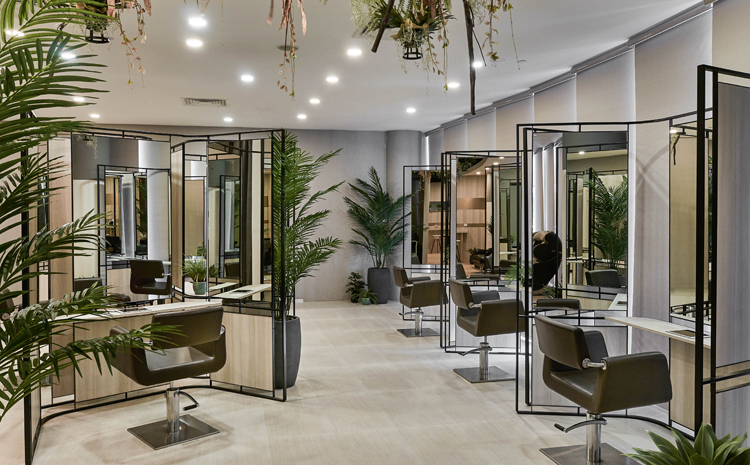 Whether you’re looking to achieve those unicorn-coloured #hairgoals, tame your mane or treat your scalp, these salons are dedicated to one thing: making you look your best. Complete the look with these homegrown beauty brands. Built for the Instagram generation, Chez Vous: HideAway is tucked away on the 14th floor of Ngee Ann City behind a little yellow door. 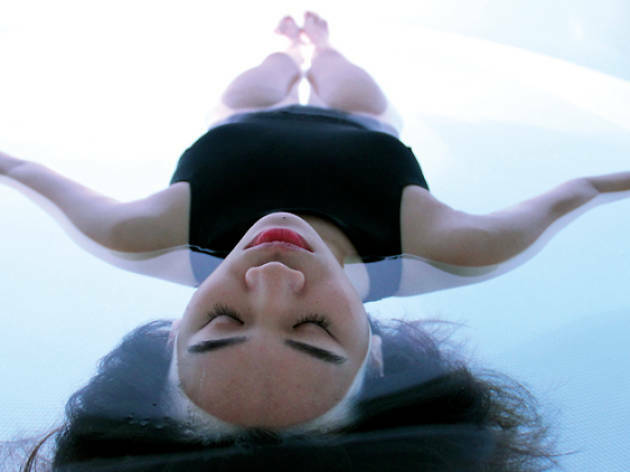 There are seven experiential zones throughout the salon, from the Re:Charge relaxation den decked out in leather massage chairs, red light scalp therapy machine and an oxygen bar overlooking a wall covered in flowers to the rose quartz private room, a pale pink cacoon for VIPs and guests looking for absolute privacy. 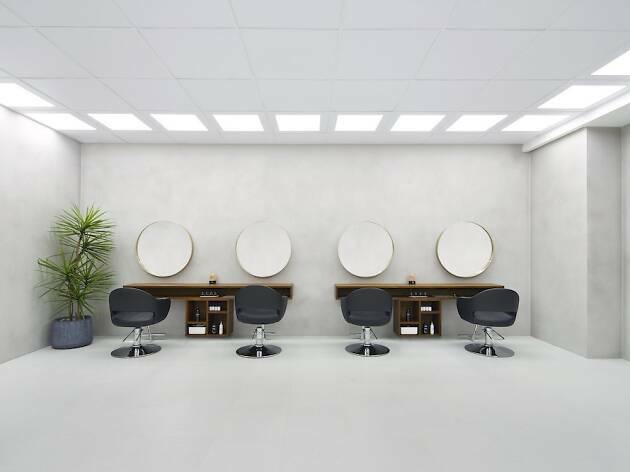 The main salon is a minimalist black and white square illuminated by bright lights. There's a curious bathtub covered with plants as a centrepiece, a reference to the spas of Bali. After all, Chez Vous: Hideaway is a place for relaxation. After welcoming me with a lemongrass and butterfly blue pea flower drink – just like checking in to a resort – I'm given a quick massage before my consultation begins. For $199, I get a haircut and one hair service, which could be anything from a hair treatment to a dye job. I opt for the Growth Factor Therapy as a treat for my flaky and dry scalp. The eight-step treatment cleanses the scalp by removing buildup with a high-frequency comb before I'm given a relaxing massage to thoroughly remove any impurities. Then, my scalp is renourished with an essence, masque and tonic before plasma and red laser are used to stimulate the scalp and encourage hair growth. 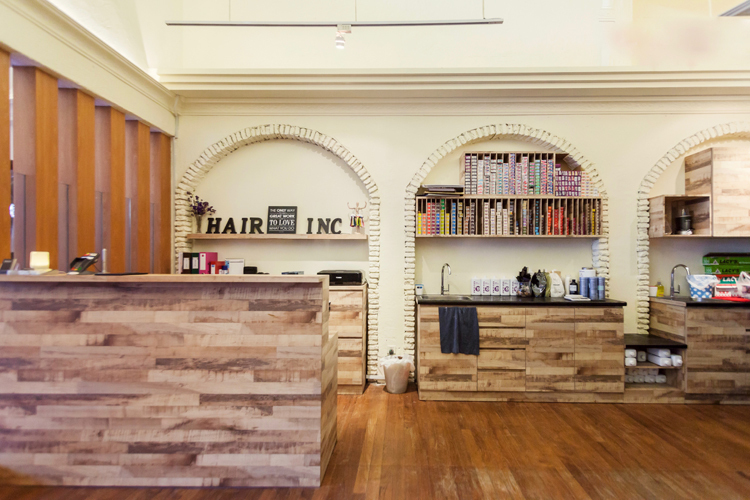 Make plans to resuscitate your damaged locks at Prep Luxe. 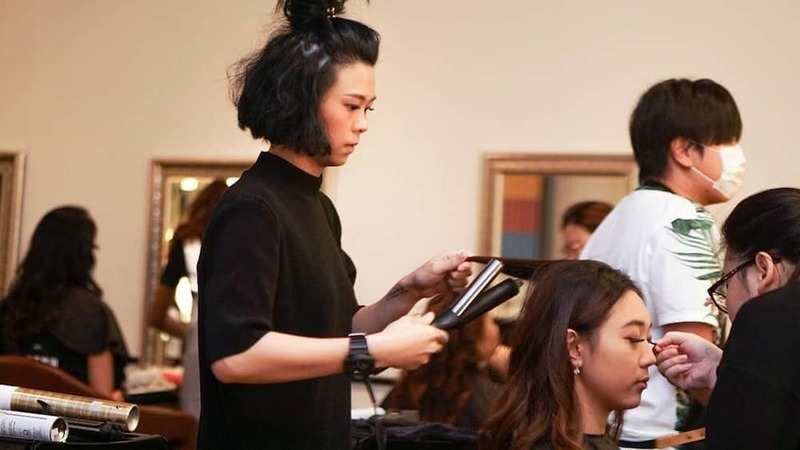 Owners Jaclyn Soh, Jacqueline Chang and Yishi Lian believe looking well-groomed should be an everyday affair and launched the hair and makeup salon two years after they started the PREP brand in 2013. Start with the two-step Olaplex hair restoration (from $120) that’s ideal for dyed or bleached hair, or try one of its signature blowouts (from $45), which comes with six style options including voluminous curls and a tousled, beachy ’do. 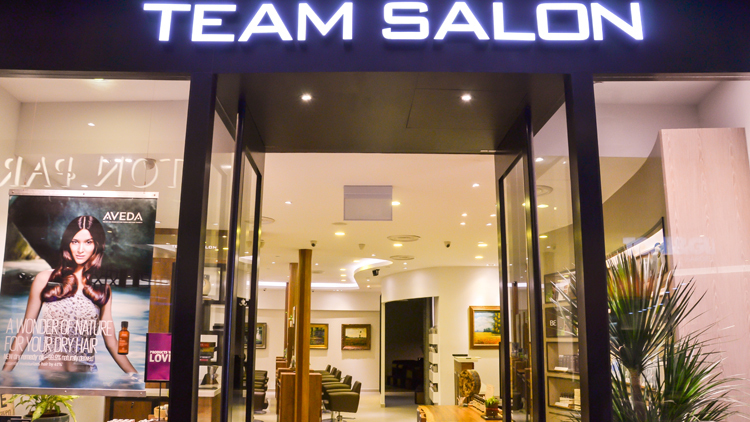 The salon also offers complimentary blowouts with its full head colouring and highlights service, which go from $260. Rebecca Liew recommends the… Olaplex Hair Restoration ($120-$130) and Prep Luxe blowout ($45-$55). The two-step Olaplex hair restoration’s famed for its ability to repair broken disulphide sulphur bonds in your locks – that means reversing the damage caused from colouring and bleaching by building up elasticity and shine. A bond multiplier was worked into my locks to replenish protein, followed by a 10-minute spritze of nano mist to boost absorption of the treatment and a scalp massage to unknot tension. Then, to finish off, my hair was given the classic Prep Luxe blowout and freshly curled and set. I left with shinier, voluminous hair devoid of frizz – and that healthy sheen remained for at least two weeks, with the help of daily hair masks. Sofiana Ramli recommends… LeeKaJa’s signature Cinderella treatment (from $300). Frizzy hair, begone. 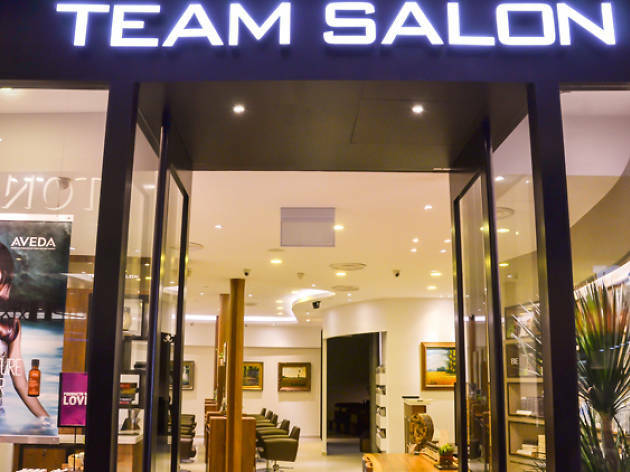 The salon’s signature treatment aims to make hair shinier, smoother and stronger so that you can have healthy looking locks for weeks. First, my hair was washed with a protein-rich, organic keratin shampoo, followed by a strengthening cream that was applied to my roots and then the ends of my hair. Once the cream has settled, my stylist, Jenny Kang, began blow-drying my hair to open up the cuticles before using a hot iron to allow the formula to penetrate through each strand. She continued to flat iron sections of my hair – so that the nutrients are locked in – before rinsing my hair in cold water to seal in the treatment. The two-hour long process is finished off with some styling and I walked out of the salon feeling like Cinderella myself. I was definitely impressed by how long the treatment lasted. Despite washing my hair daily, it remained sleek and glossy for weeks. 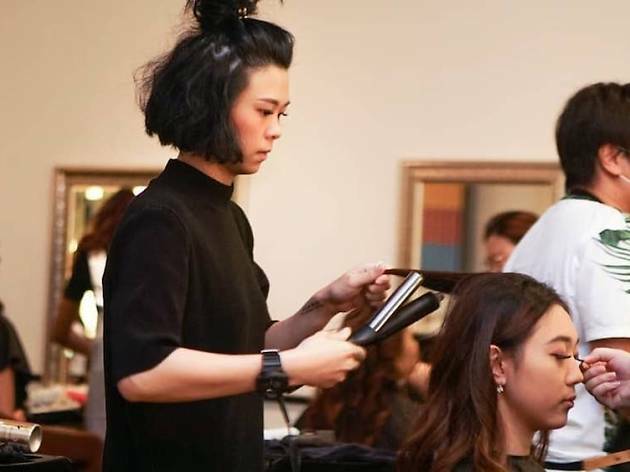 Surely, you’ve heard of Chez Vous – after all, this OG award-winning hair salon tucked in a corner of Ngee Ann City spruced with a few artistic touches has been giving their clients good hair days since 1995. That’s a good 22 years and all hair stylists have to had at least 10 years’ experience before they’re taken on board so you can be sure Chez Vous know their stuff. Of course, you’ll be treated like royalty – you can request for semi-private VIP room and surf the net using the salon’s high speed wifi while being padded with cushions and blankets all. Hungry or thirsty? Flip through the salon’s tea and treats menu to order from. For an additional fee, you can also get manicure and pedicure done. Très fancy. Michelle Ng recommends… Express Revitalising Supreme ($185). After getting my long hair chopped off into a shoulder-length ‘do by the associate salon director ($70) and coloured ($205), my bleached (and very fine) hair was treated to an Express Revitalising Supreme treatment. The name is misleading – it’s ‘express’ because some steps are combined to ensure you spend as little time sitting on the chair as possible but the results of this “hair facial” (as my stylist called it) are definitely not short-term. I experienced lesser hair breakage in the days to come and my new ‘do maintained a shiny, smooth texture for about two weeks. Raymond Eng and Anthony Chu started Black Hair Salon in 2000 and have built a base of loyal customers who rely on them for the perfect hairstyle. 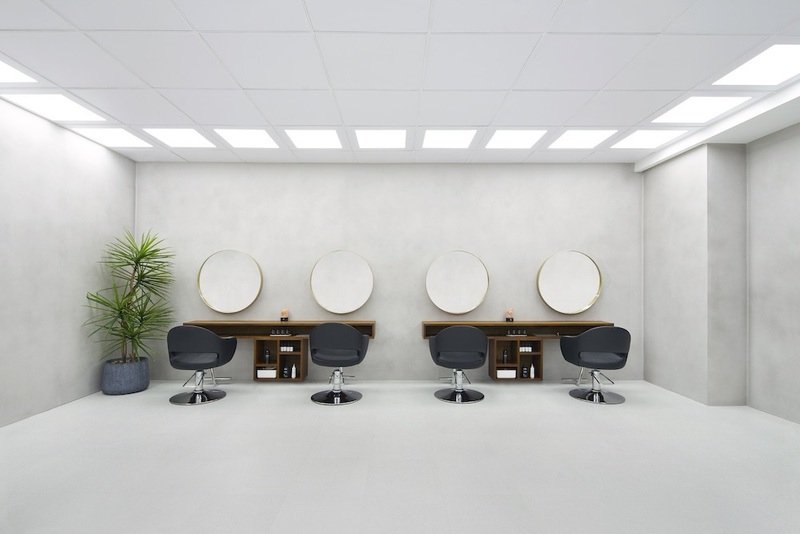 Don't expect a large, glamorous studio, Black is a small but tight ship run by experienced hair stylists who have been at the salon for years. Most clients come for its colouring services, and it's not just for your typical shades of brown. Black also does colours like purple, pink, blue and green. A basic cut here starts from $30 for men and $35 for women, while creative colouring starts from $188 and includes bleaching. If you're concerned about the bleach drying out and damaging your hair, opt for an Olaplex pre-treatment ($40) or Olaplex full treatment ($100) to ensure that your hair is protected. Other treatments are also available, just ask your stylist for recommendations. Nicole-Marie Ng recommends the...creative colouring service (from $188). I opted for purple and my stylist Anthony took into consideration my lifestyle and hair condition to choose the ideal shade for me. He recommended a cool-toned purple that would fade to an ashy brown and won't need constant touch-ups. Although I was initially sceptical on how long the colour would last, my vibrant purple hues remained for a good month. For locks worthy of a K-Pop star, drop by Bella-K Beauty House. 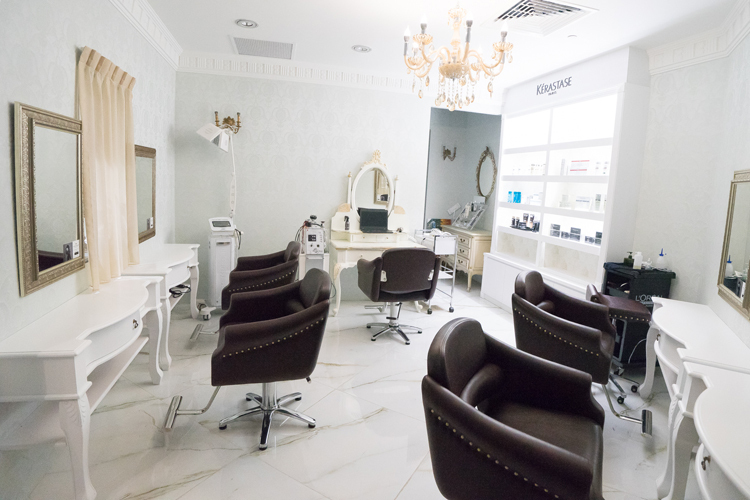 Tucked away in a tranquil corner of Nassim Road, the Korean salon offers hallyu-inspired cuts and treatments in a setting befitting of celebrity royalty. 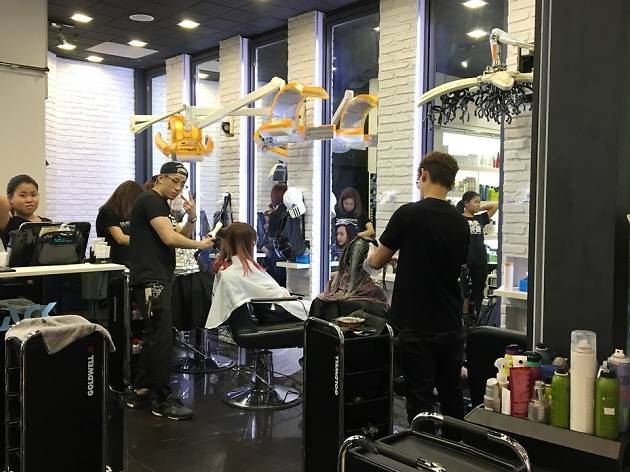 Opened in early 2016 by the stylist Gunhee – he who has sculpted the tresses of JYJ, Super Junior and 4Minute – the salon reflects South Korea’s obsession with beauty to a tee. 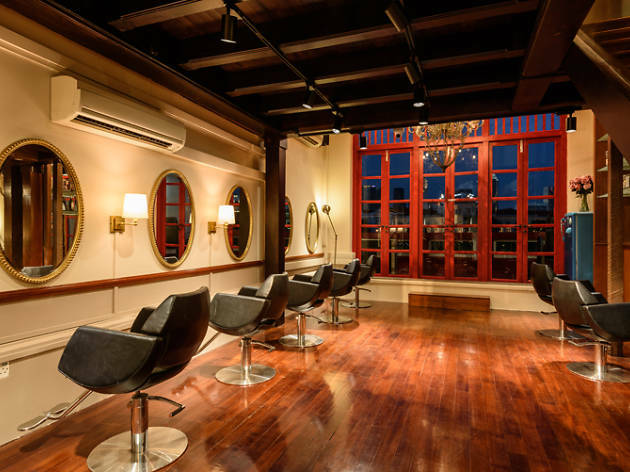 Step in and you’ll be greeted by plush leather chairs, floor-to-ceiling mirrors and videos of the mane man appearing on beauty shows and haute fashion events. 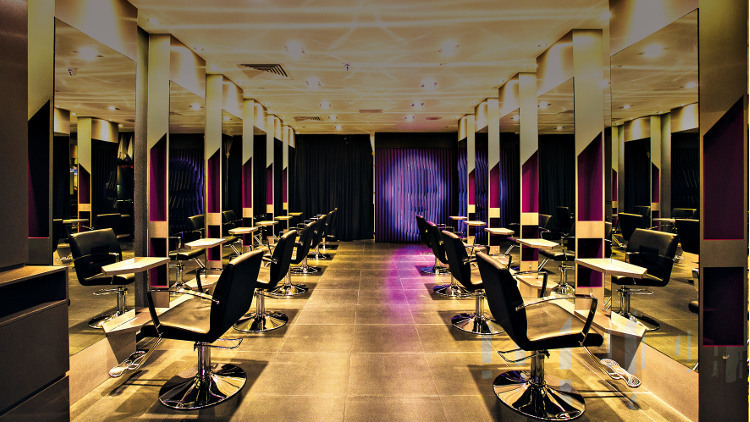 Cuts start at $68, while the full works – a cut, wash and blow – will set you back about $148. Colouring starts at $268. 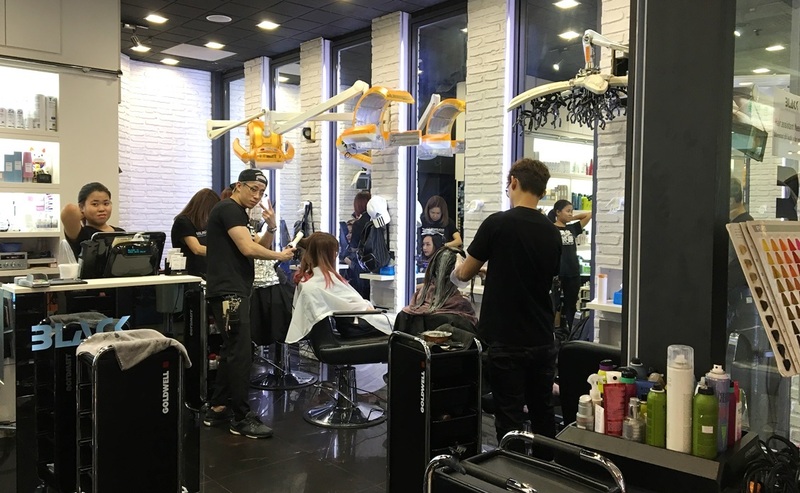 The price tags are more than made up for with top-notch service, courtesy of a team of experienced stylists from South Korea. They fuss over every detail, like using Olaplex-1 and Olaplex-2 treatments to keep your locks healthy during bleaching, while you sit back with an iPad stocked with Netflix shows. 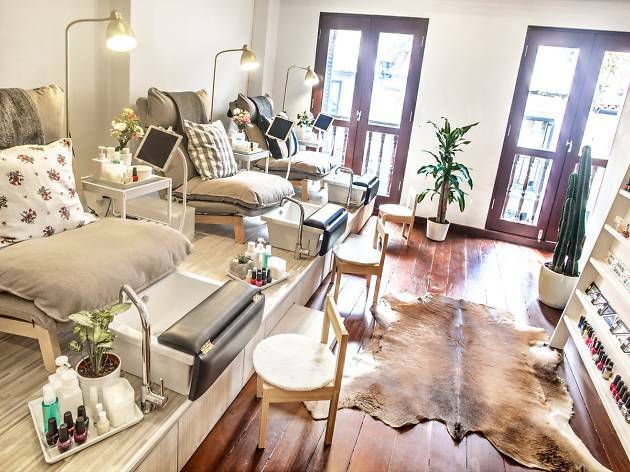 For the VVIP treatment, pamper yourself at the mani-pedi area for intricate nail designs (from $58 for a classic mani) that match your new ’do. Jessica Lai recommends the… Bella Volume Magic Straight Perm (from $438). For those who bemoan their limp, flat hair (like yours truly), this perm works its magic with volumising and conditioning effects. My hair is first softened – by Gunhee himself, no less – then styled with a flat iron to give it the sleek, straightening effect of rebonding without the poker straight look. For those seeking the luscious waves as seen on hallyu starlets such as Park Shin Hye and Bae Suzy, go for the digital perms (from $408). An appointment with the effervescent celebrity stylist starts at $350, which is well worth it considering you’ll get to brag that you share the same stylist as top K-Pop stars. Michelle Ng recommends the… Texture Smooth Double Hair Treatment (from $280). Developed by Salon Vim’s stylists, the treatment smoothens frizzy and unmanageable tresses in just 30 minutes – perfect for popping in and out during lunch. After cleansing and conditioning my hair, an anti-ageing serum infused with hydrolysed marine collagen and amino acids is applied, which the salon claims strengthens hair fibres from within. 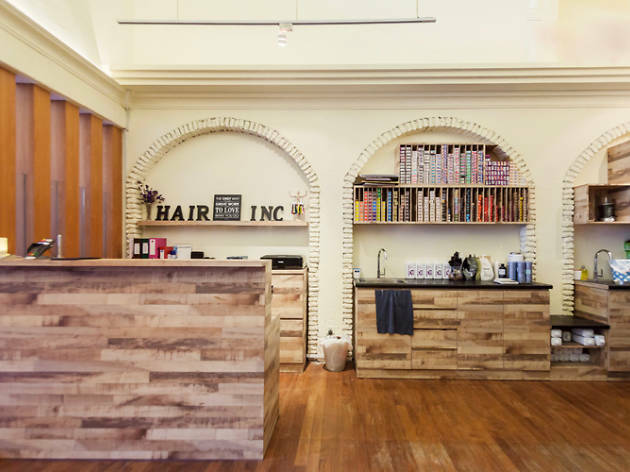 Hair Inc’s relatively new to the game – its first outlet only opened in 2013 – yet the salon’s already known for its anti-frizz treatments and creative colouring services. 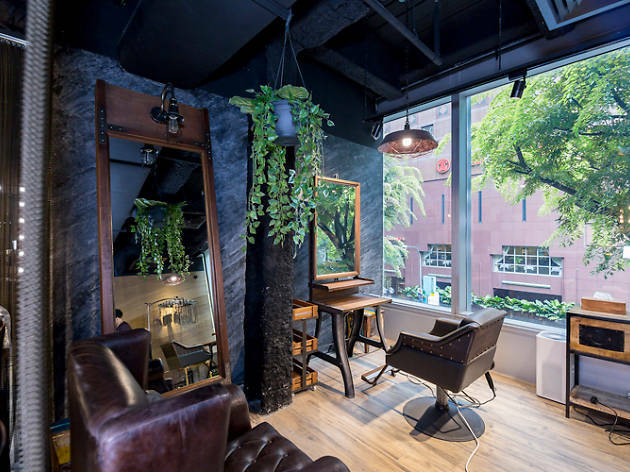 Haircuts at the chain’s Holland Village branch range from $18 to $55 for men and $28 to $78 for women, with services such as ombre and balayage starting at $158 and bleaching at $138. There are ten treatments here, including Silky Smooth (from $298) and the Olaplex 2-step Treatment (from $108). The latter uses the famed Tokio Inkarami system from Japan and contains six kinds of keratin and fullerene, whose claim is to stimulate hair growth and rebuild the condition of each strand by up to 140 percent, ensuring softer and more manageable manes for up to three months. Rebecca Liew recommends the… The Creative Colour Full Head package (from $258). A shade tailored to your skin tone and requests – such as dusty lilac with ash blue undertones, the one I picked – is mixed with Olaplex to protect your hair from the chemicals present in the dye mixture. Also try the Olaplex-2 Treatment with Hair Inc 3-step Treatment (from $78), which breathes life into dull, brittle locks. My stylist (ask for Kenneth Goh, the director) explains each step, from ‘priming’ the hair to incorporating a rich, leave-in conditioner that’s selected based on the condition of my tresses. The 150-minute-long process concludes with an express hair spa to seal the hair cuticles while the scalp’s massaged. It’s worth every bit of your time, because you’re rewarded with tangle-free and sleek hair. 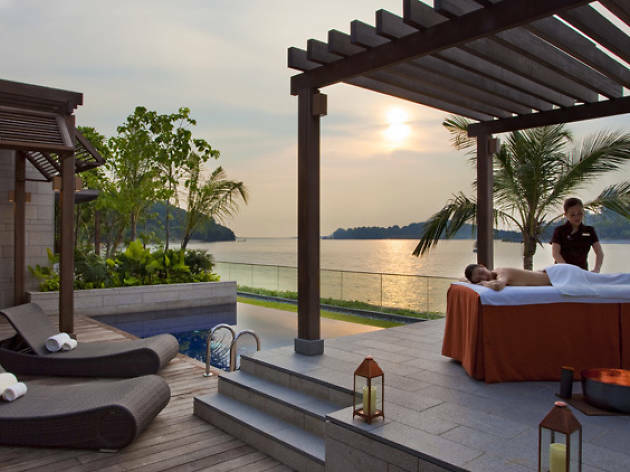 Sofiana Ramli recommends the… Ultrasonic Premium (from $118). If your mane’s anything but silky or soft, then this treatment’s the one to tame it – no heat necessary. This anti-frizz process is designed to revive and nourish damaged and lifeless hair by using an ice-cold (yep, not hot) flat iron, which vibrates at 37,000 beats per second to separate the protein, water and oil in hair treatments. Number76 claims this method ensures the nutrients from the treatment are sealed deep within your hair cuticles, locking in moisture. First in the three-step process: adding collagen. My hair ends are fed with the protein to strengthen them, followed by a spritz of moisture before rinsing it all off. The ultrasonic apparatus is used after every step to ensure all the good stuff’s absorbed by my hair. The session, which lasts no longer than an hour, continues with a hot towel scalp massage and finishes with a quick hair blow and styling. Voluminous, frizz-free, texturising: if your knowledge of hair products runs like a dictionary, you'd know Bed Head by TIGI — and with it, the cult UK hair label's namesake salon. 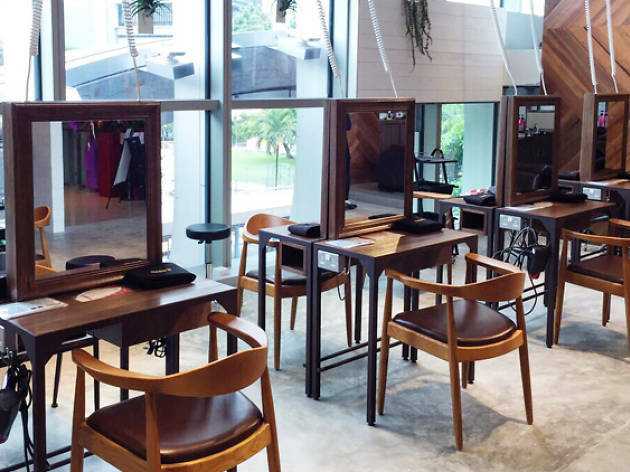 Its 1,600-square-foot salon outlet in Singapore promises treatments and colouring services (from $100) that’ll work for each hair type, with a basic cut-and-wash starting from $40. But TIGI’s known for pushing experimental hair colours. 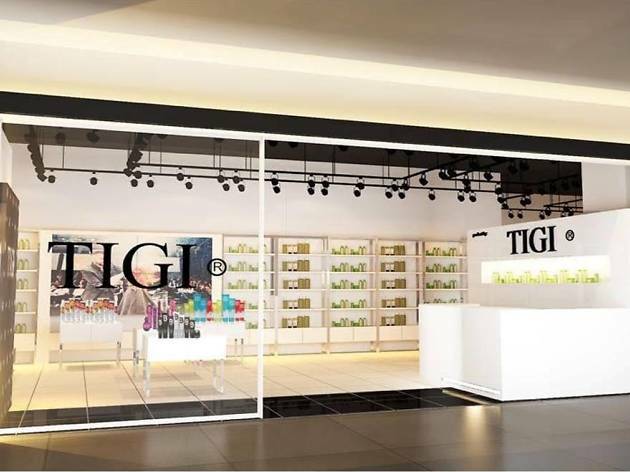 Particularly popular is the TIGI Bed Head Colour Trip, which offers 12 semi-permanent, acidic shades that can be customised to achieve soft pastel hues or a vibrant head of hair. You’ll be in good hands as creative director Hidero Nakagami's has over 30 years' experience, so expect no less than sleek hair and colour that lasts for weeks. 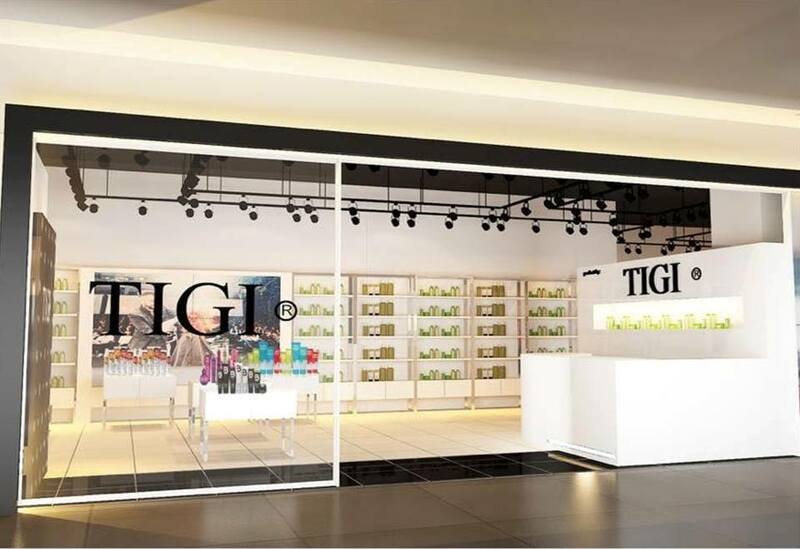 The TIGI hair colouring service (from $70/bleach, and $100/colouring). After accessing the condition of my hair – it's been twice-bleached and had undergone several dye jobs in the past year – Hidero suggested a simple touch-up in ashy grey tones to neutralise the orangey wash of my bleached hair. To restore amino acid in my locks, bleach treatment containing keratin was first spritzed on as a primer. Then came the actual toning of the hair, before I was taken for a hair wash and head massage. After a quick blow-dry and trim, Hidero then ran a frizz control and straightener serum through my hair to achieve a sleeker ’do before finishing things off with some texturising powder balm. I left with visibly sleeker and softer hair done in a soft ash grey colour that's meant to last up to three weeks. Rebecca Liew recommends the… Technical colour with balayage and ‘free-painted’ highlights ($150-$230, excluding bleaching). It adds dimension and creates the illusion of volume, which works especially well for finer locks such as mine. My resulting light lime ash with silver undertones are determined at the ‘hair analysis’ stage, during which swatches of colours are placed upon and swapped around each shoulder to suss out the perfect match for my complexion. 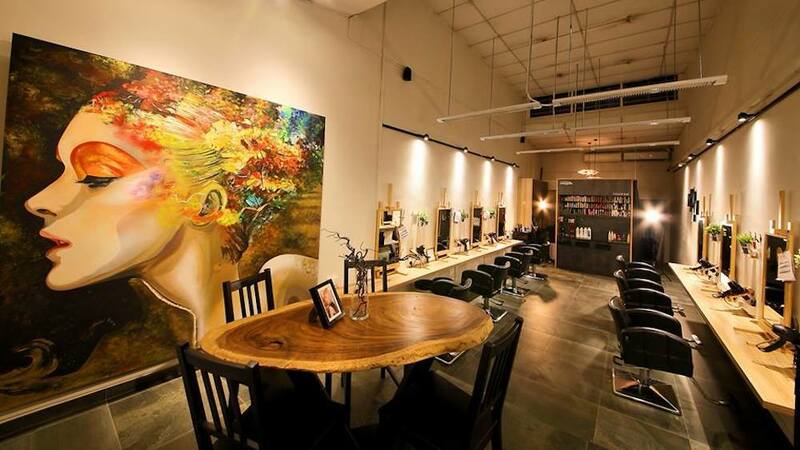 Ask for the affable stylist Scarlett Zhu, whose ten years of experience certainly shows. 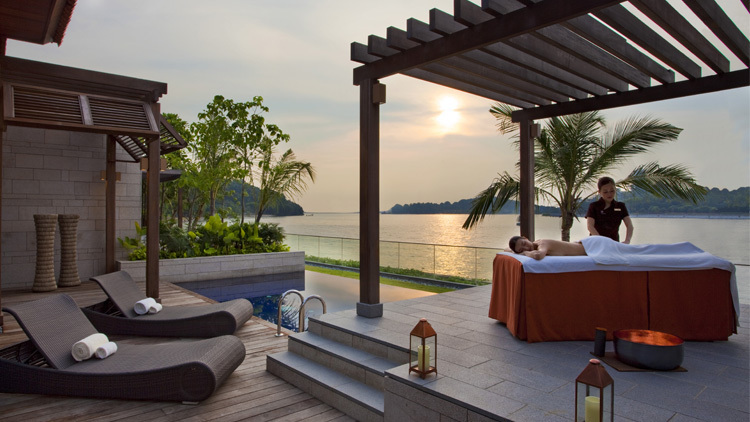 Sofiana Ramli recommends the… Botanical Hair and Scalp Therapy (from $230). It begins with an intensive scalp diagnosis by a stylist before I’m treated to a tension-reducing neck and shoulder aromatherapy massage as soothing music strums in the background. 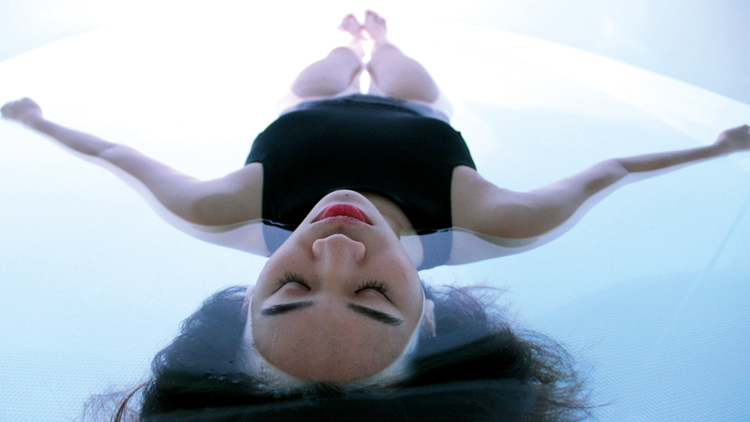 The massage ‘opens up your chakras’, which better allows the essences of the treatment to infuse into my hair and scalp, or so the stylist tells me. A deep-cleansing shampoo ritual then removes any excess oil that accumulates on the hair cuticles, leaving a tingly and cool sensation on my scalp. That’s followed by a 15-minute ‘Nano Mist’ treatment – it’s meant to hydrate my locks before even more tonics and serums are added. 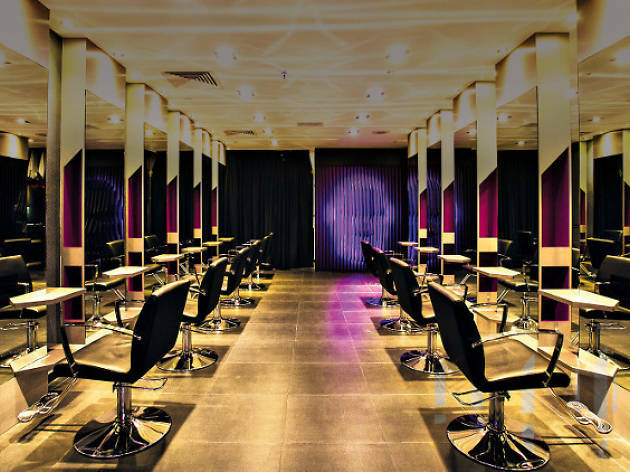 Deemed as the first ammonia-free hair salon in the city, this lifestyle concept salon extends beyond the regular haircut. 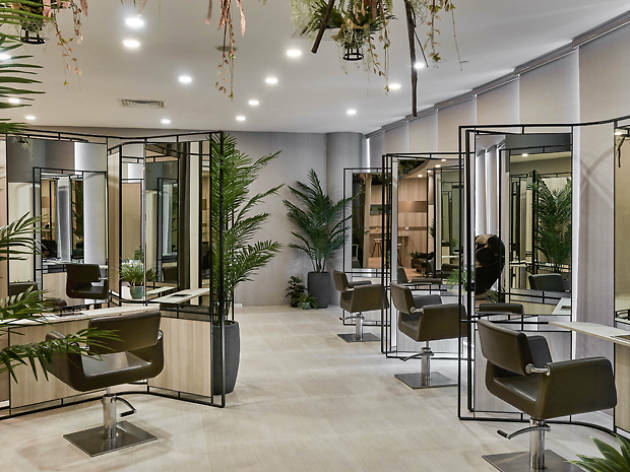 Whether your new look consists of a fresh perm, a new colour or a blowout for that extra volume, simply book a consultation with its team of hair pros who will turn your new 'do into a work of art with the use industry-leading techniques. 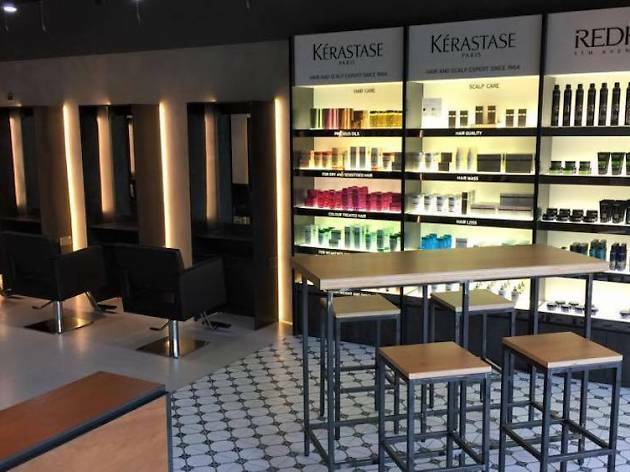 The salon also offers fashion items and lifestyle products to snap up, as well as other services such as nail care and beauty makeovers for the complete transformation. 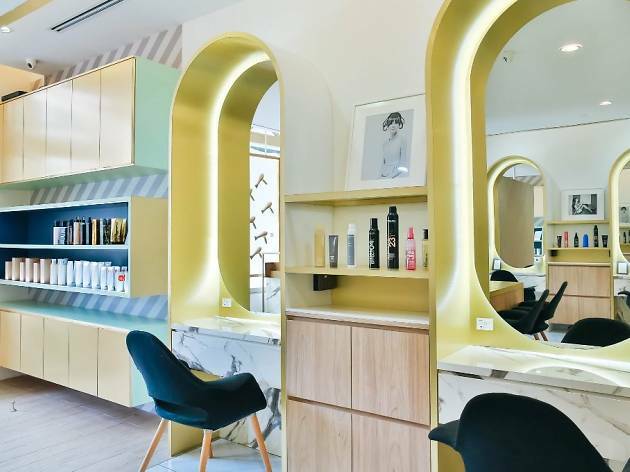 If you think Haji Lane's cool and colourful, wait until you see the tresses that step out of this hair salon. 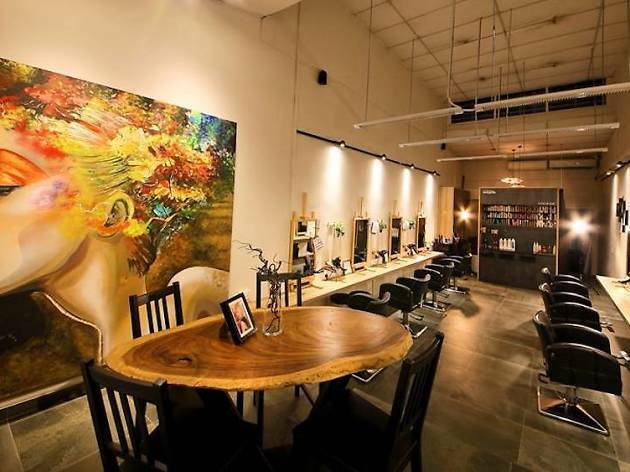 Aptly named Picasso, the hair salon prides itself for giving customers an artistic hair makeover. And that's not all – its interiors goes hand-in-hand with its art-studio decor like mirrors on easels and vibrant wall murals. Thinking of switching up your hair colour? This is the place to achieve all your hair goals (including that pastel unicorn style you've been eyeing on). Its hair colouring services range from ombre colouring and highlight to lifting and balayage. Other services include haircuts, styling, perming, straightening and treatments at reasonable prices. 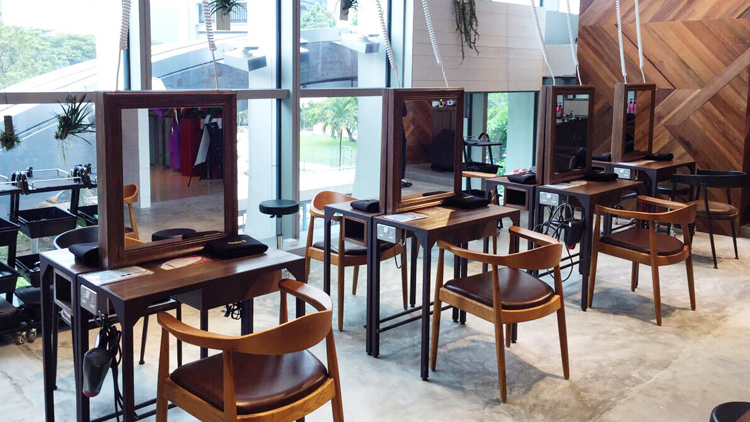 Sip on a glass of bubbly while you pamper your tresses at its cool digs in Boat Quay. 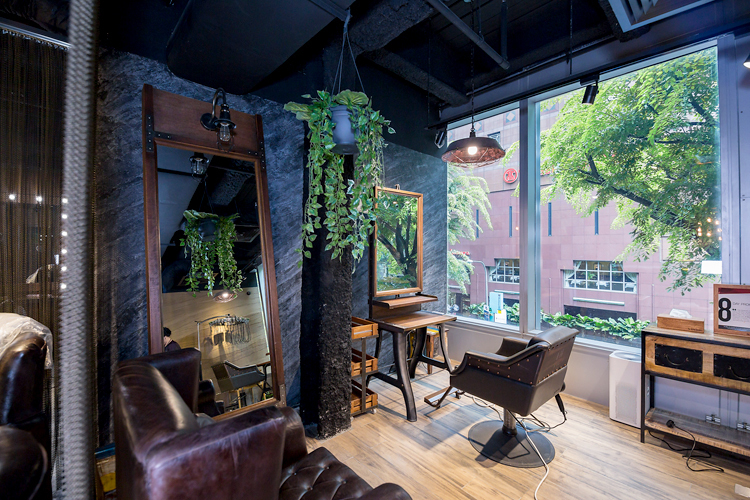 Specialising in blowouts, the salon nestles itself in a swanky space that boasts eight seats, three hair wash beds, and a balcony that overlooks the bank of Singapore – perfect for that look-at-my-new-‘do Instagram shot. Decked out in its signature colours of red and white, this outlet's decor suits its hugely popular hen, birthday and wedding pretty party packages that’ll have you and a bunch of your closest girlfriends looking effortlessly coiffed while you’re having a riot of a time at the salon. This multi-award winning global favourite is a no-brainer when it comes to runway-ready tresses. The best bit? 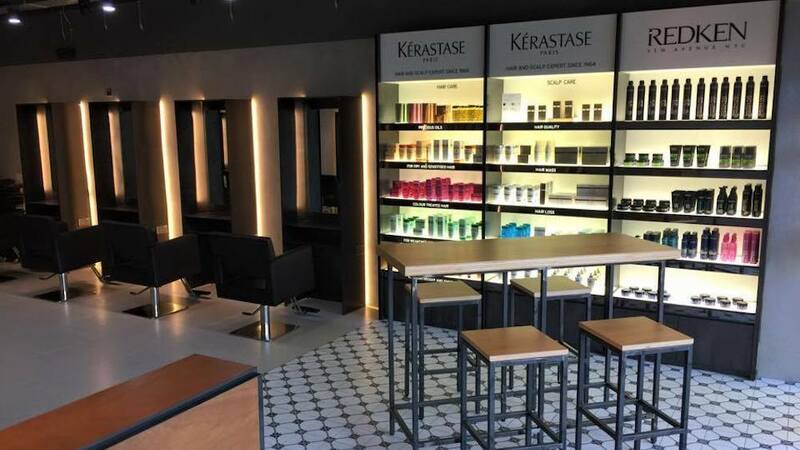 The city's Toni&Guy salons are strategically located in areas where convenience and access is key, giving customers the absolute urban retreat while reinventing their contemporary style. Expect the vibe to be raw and relaxed, with timber panelling and exposed brick interiors. Aside from offering the usual cut-colour-wash-blow dry services, you can also indulge in the System Professional treatments and colouring services using Wella products on the second floor. 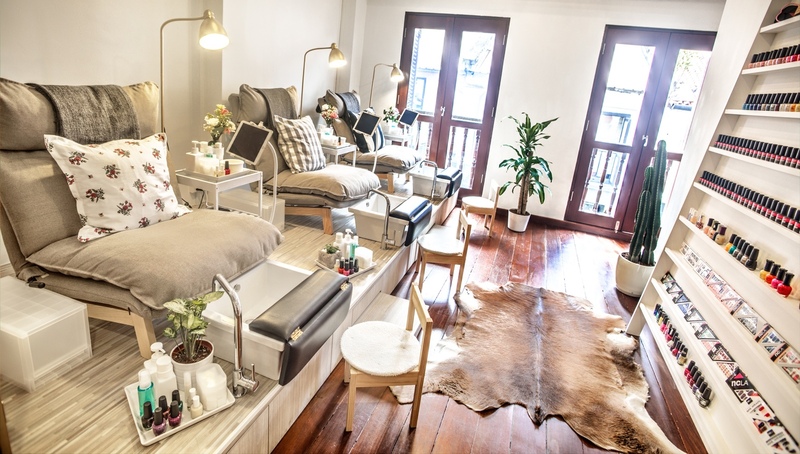 Then, head to the room next door for a manicure and pedicure to complete the whole pampering experience. 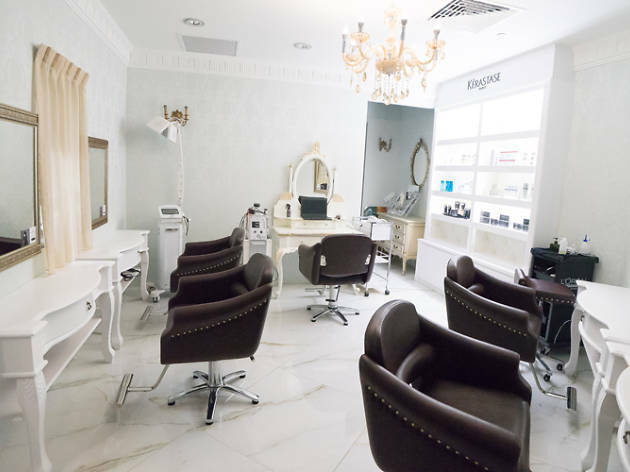 As its name suggests, Expat Hair Studio specialises in styling Caucasian hair and caters mainly to expatriate clientele. 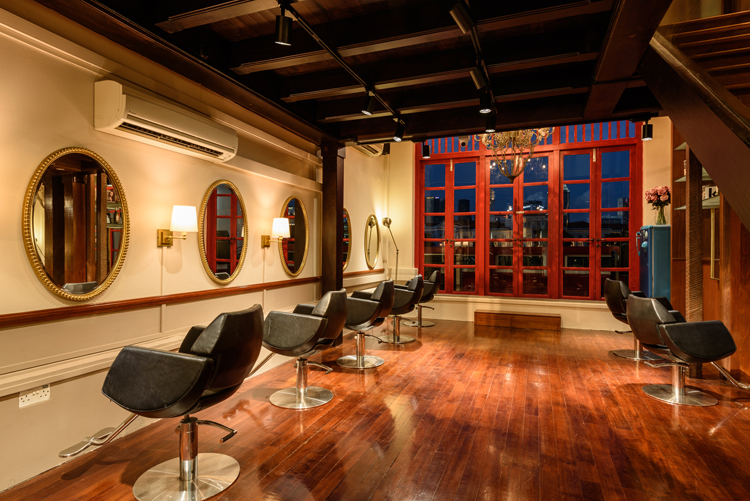 Started by expats Jaclyn Douglas and Katherine Moss, Expat Hair Studio offers cuts for men, women and child, blowouts and even complete hair makeover to obtain the tress of your dreams.